The MARDI GRAS JAZZBAND will be back to delight you all, with their wonderful jazzy and happy attitude to life, to entertain you here at our FARNBOROUGH JAZZ CLUB (Kent) on Friday, 30th SEPTMBER 2016. The musicians with leader and trombonist ROB PEARCE, will be LEIGH HENSON on trumpet &vocals, JOHN ELLMER on reeds-a-plenty, TIM HUSKISSON on piano, MARC EASENER on double bass &Sousaphone and PAUL BAKER on drums. You will certainly enjoy what you hear, even what you see – ha, so make sure you don’t miss this evening – 8:00pm start. This entry was posted in Mardi Gras JazzBand on September 27, 2016 by Diane. We’ve got the SUSSEX JAZZ KINGS, who are great fun and will certainly ensure you make whoopee at the FARNBOROUGH JAZZ CLUB, this Friday, 23rd September 2016. These guys are great favourites of everyone and are leader DAVE STRADWICK on trumpet, IAIN MCAULAY on trombone, BERNARD STUTT on clarinet, KEVIN SCOTT on banjo, PETER CLANCY on d.bass &sousaphone and PETE LAY on drums. So we start at 8:00pm till 11:00pm. All are welcome. Plenty of dancing will be the order of the evening. This entry was posted in Sussex Jazz Kings on September 22, 2016 by Diane. ‘BATTLE OF BRITAIN’ ANNIVERSARY- Art & Jazz FARNBOROUGH JAZZ CLUB 16th September 2016. 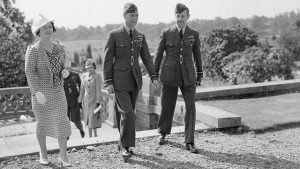 CELEBRATING BIGGIN HILL’S PART IN THE BATTLE. BATTLE OF BRITAIN ANNIVERSARY Art&Jazz FARNBOROUGH JAZZ CLUB 16September 2016 CELEBRATED BIGGIN HILL’S PART IN THE BATTLE. We celebrated this year’s ‘BATTLE OF BRITAIN’ 76th ANNIVERSARY with an art exhibition to show Keith’s Grant’s Spitfire and jazz watercolour paintings, plus a special fun jazz band called ‘THE FENNY STOMPERS JAZZ BAND. This all happened here at our FARNBOROUGH JAZZ CLUB in Kent. Unfortunately we had missed that very special marker – the 75th – last year due to my family circumstances, but we certainly celebrated in style this year. It was a fancy dress party (although was optional of course) and some great photos will follow to show off the brilliant effort by some. 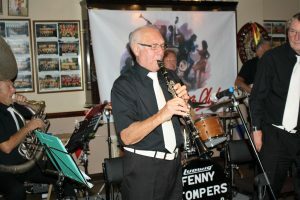 The band intended giving us plenty of entertainment with a 1940’s flavour and that they certainly did. DENNIS VICK (leader) was playing clarinet, DAVE MARCHANT played trumpet & harmonica, JOHN LEE played trombone, BRIAN VICK (Dennis’ brother) played banjo, DAVE ARNOLD played both double bass & Sousaphone and KEN JOINER played drums. 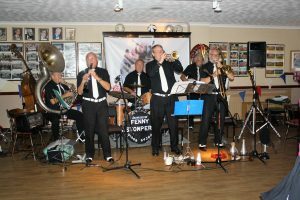 The Fenny Stompers play at Farnborough Jazz Club’s ‘Battle of Britain’ Anniversary fancy dress party ,16th September 2016. (LtoR) Dave Arnold (Sousaphone), Dennis Vick (clarinet), Ken Joiner (drums), Dave Marchant (trumpet), Brian Vick (banjo) and John Lee (trombone). Photo by Mike Witt. 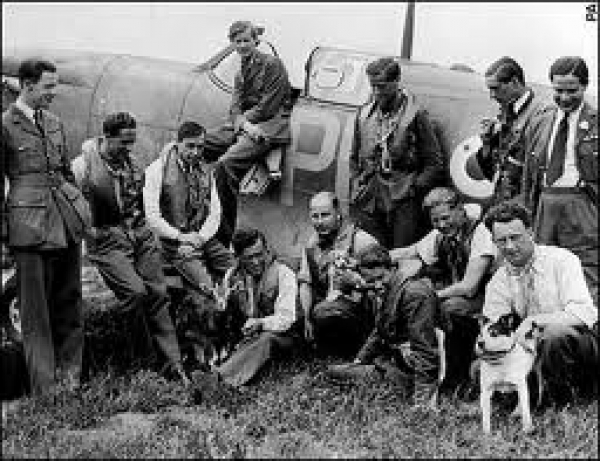 ‘Battle of Britain’ Pilots 15th September 1940. The celebrations were in honour of those RAF boys (and they were boys, most of them) from 15th September 1940 (not just 15th either) and the band did them proud. 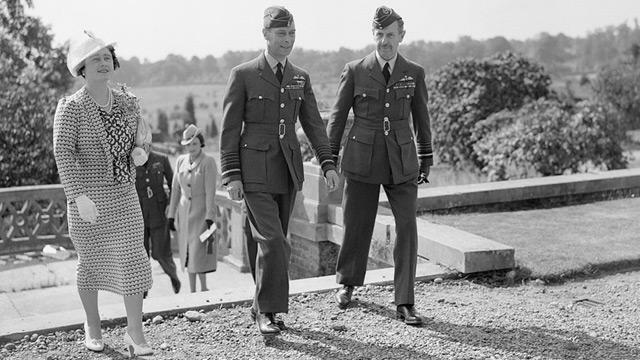 We are just over three miles away from Biggin Hill (on the flight path too) and Keith remembers, as a little boy, standing on his front doorstep, seeing all the Spitfires and Hurricanes, during the fighting off of the enemy bombers, making them fail their mission to annihilate London. Although there are many pubs close by, that these lads frequented, we are also literally just seven miles away from perhaps the most famous one, The White Hart, in Brasted, Kent. This was where footprints were found on the ceiling, left by the WRAFS being held up by pilots (who were letting off steam) to ‘walk the ceiling’. So you see, they were fun seeking and would have loved this band and the antics they got up to (sadly, I’m told the pub no longer holds any original memorabilia – I wonder if the footsteps have been removed). The band played plenty of dance numbers for us and I shalll try to ‘draw a picture’ of how the evening went. 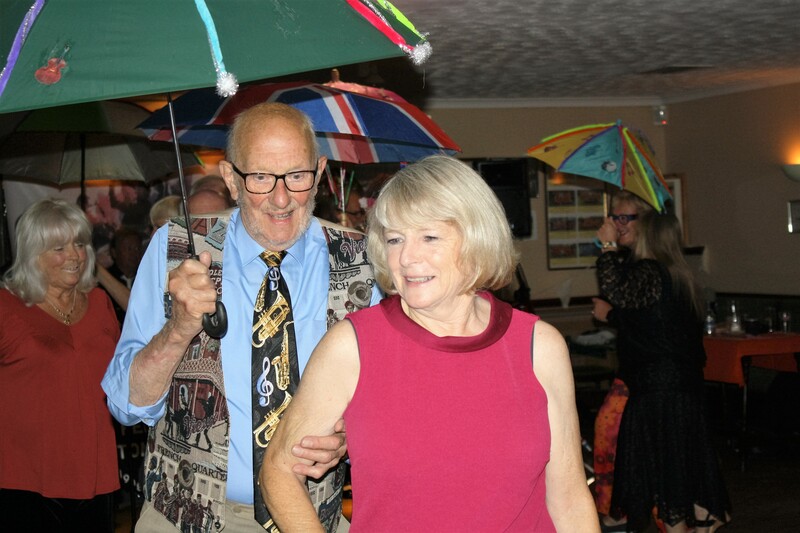 I was so busy and so I’m afraid I failed to write my notes down, but can tell you, ‘Canal Street Blues’ was super and we all got up to perform our line-dance – I wasn’t drunk, but I did go wrong a few times (leaving us laughing) and no, I’m not getting old – or decrepit either!!! What did you say? 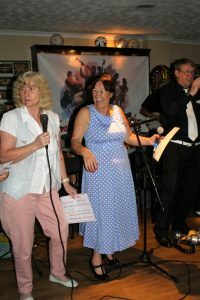 ‘Battle of Britain’ Annivertsary celebrations with The Fenny Stompers at Farnborough Jazz Club, Kent. 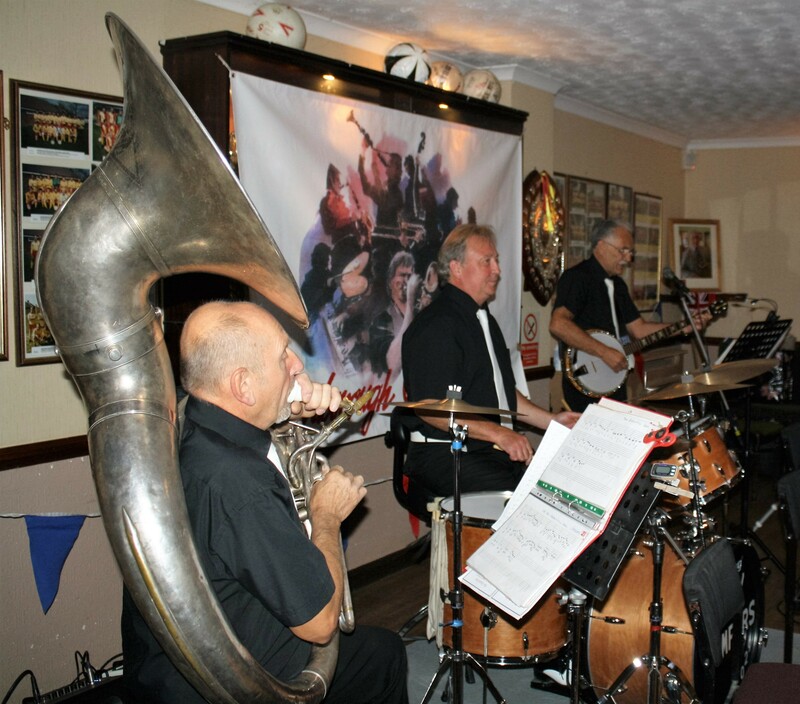 (LtoR) The ‘engine’ boys, being Dave Arnold on Sousaphone, Ken Joiner on drums and Brian Vick on banjo. Photo by Mike Witt. Dennis Vick takes a solo, whilst Dave Marchant looks on. (LtoR) Dave Arnold (Sousaphone), Dennis Vick, Ken Joiner (drums), Dave Marchant and Brian Vick (banjo), plus( not in view) John Lee (trombone), members of The Fenny Stompers at Farnborough Jazz Club’s ‘Battle of Britain’ Anniversary fancy dress party on 16th September 2016. Photo by Mike Witt. Anyway, John was featured to play the next number, being ‘Honeysuckle Rose’. He is a lovely trombone player and played with such feeling. Then I loved them playing ‘Chimes Blues’, such a wonderful rendition (especially on the second time, they played so softly and so in tune (the front line that is), playing the ‘bells’ brilliant. Next came Brian’s feature. He played ‘The World is Waiting for the Sunrise’ just spectacularly. It’s a lovely tune and has been played by other bands here, but not too often, well done Brian. 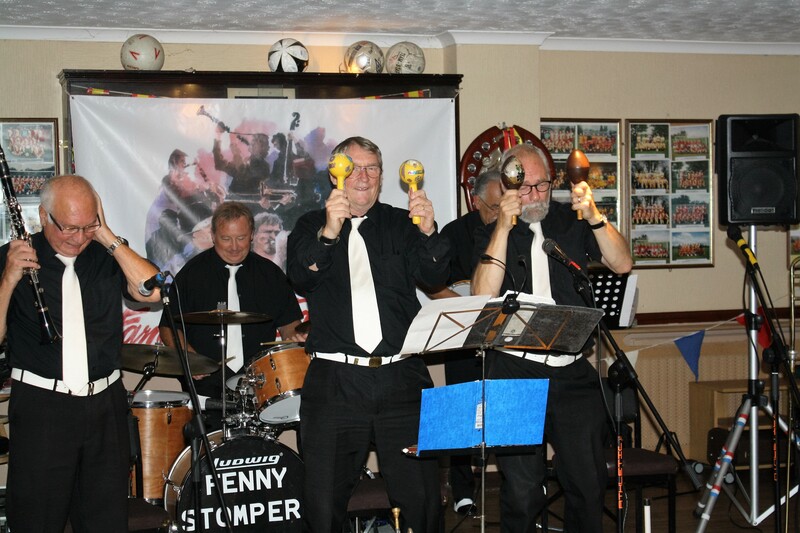 ‘Swinging Shepherd Blues’ was a number played next for the brewery (SHEPHERD NEAME), who supply our club with our bear They played it so well too, especially Dennis. 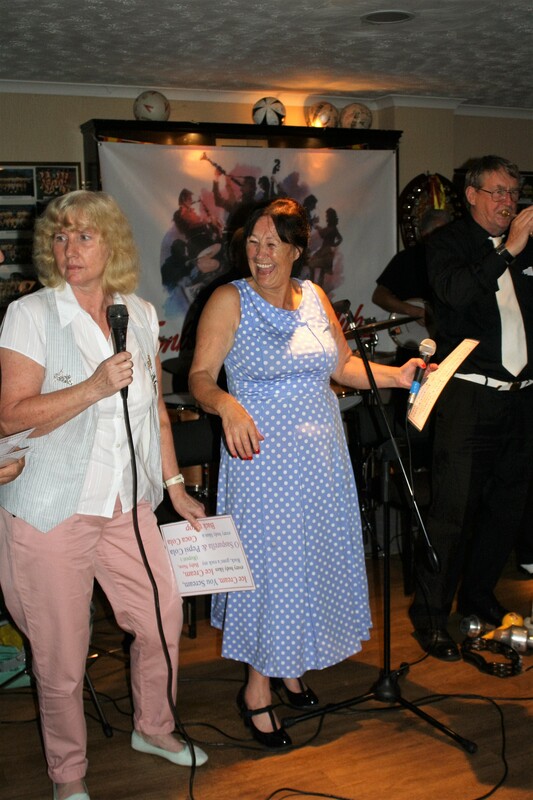 Dave Marchant (trumpet) Sue & Diane sing ‘I Scream, You Scream’ with The Fenny Stompers at Farnborough Jazz Club, Kent, for ‘Battle of Britain’ Anniversary fancy dress party 16Sept2016. Photo by Mike Witt. ‘I Scream, You Scream, We all Scream for Ice Cream’ came next. Now I had been telling Dennis on the telephone, how I was going to be singing in a gig with Keith (for the first time,) on the following Sunday. I told him how shy I was about singing and was very nervous. How I wouldn’t sing at our club as it was a paying audience! Well the little ‘xzyxz* (if you know what I mean) got me up to sing with the band. Of course he had the placards up for me to follow the (few) words. This was with Ken’s wife Sue. Dennis also pulled Trudy from our audience, to hold the words up for everyone to sing along, plus she played the maracas. The audience loved it, because it was such a laugh. The previous week , it was requested to have a brolly parade, so the band performed ‘Bourbon Street Parade’ for us. Steve (one of our regulars) brought his collection of handmade umbrellas, complete with flashing electrics. It certainly added to the whole atmosphere. 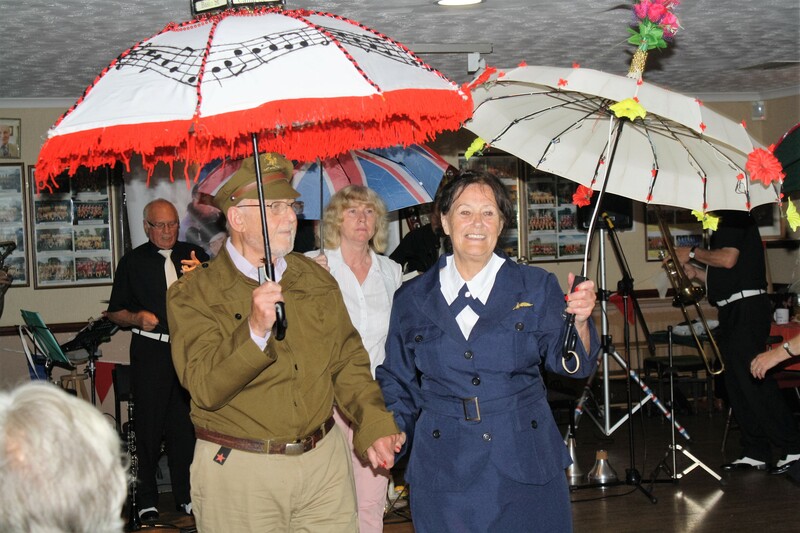 Penny and Bob take part in the brolly parade to ‘Bourbon Street Parade’ by The Fenny Stompers Jazz Band at Farnborough Jazz Club’s ‘Battle of Britain’ Anniversary fancy dress party on 16th September 2016. Photo by Mike Witt. 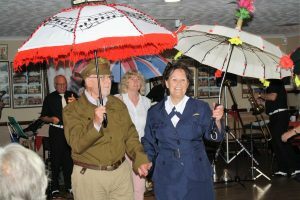 Steve and Diane take part in the brolly parade to ‘Bourbon Street Parade’ by The Fenny Stompers Jazz Band at Farnborough Jazz Club’s ‘Battle of Britain’ Anniversary fancy dress party on 16th September 2016. Photo by Mike Witt. Then came the piece-de-resistance! They performed their next number ‘Me and Jane, In A Plane’. 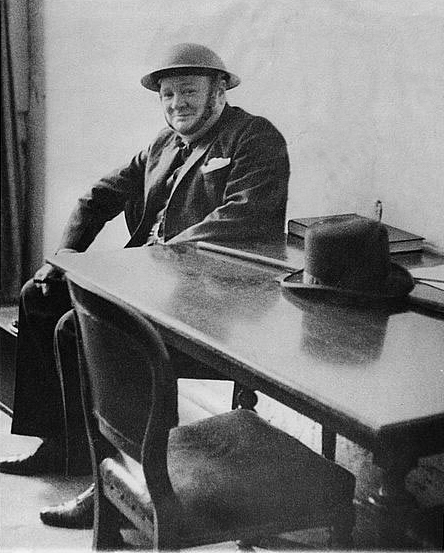 How fantastic they were, with John coming out to – and around the audience, playing his trombone, as if to be the gunfire of a Spitfire or Hurricane, dive bombing. They all had on leather caps with goggles and RAF scarves – they were brilliant. I know it isn’t unique, but was so very well done and another feature to add to the atmosphere of the evening. 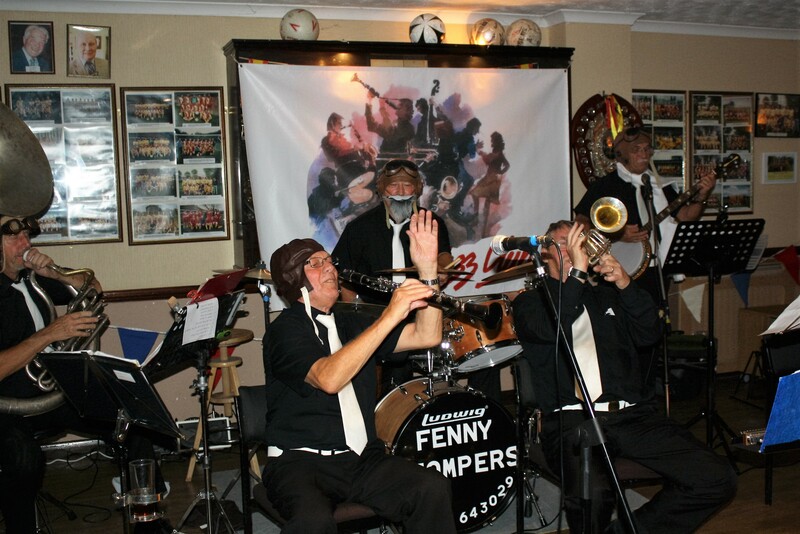 The Fenny Stompers at Farnborough Jazz Club’s ‘Battle of Britain’ Anniversary fancy dress party on 16th September 2016. The band perform in their pilot gear, to ”Me & Jane in a Plane’. (LtoR) Dave Arnold (Sousaphone), Dennis Vick (clarinet), Ken Joiner (drums), Dave Marchant (trumpet) and Brian Vick (banjo). With John Lee on trombone, goes flying about shooting around the audience. Photo by Mike Witt. John Lee on trombone, with Ken Joiner on drums and Brian Vick on banjo, members of The Fenny Stompers at Farnborough Jazz Club’s ‘Battle of Britain’ Anniversary fancy dress party on 16th September 2016. Photo by Mike Witt. We managed to fit in another line-dance to ‘Come on and Stomp, Stomp, Stomp’, which was a great number to do to, even at a Charleston beat! Then, to round off the evening, they sang the ‘White Cliffs of Dover’ with obvious audience participation. Our lovely bar staff kept us ‘happy’ with ‘Spitfire’ and ‘Master Brew’ flowing (among other drinks of course) and for this special occasion, SHEPHERD NEAME kindly gave some bottles of ‘Spitfire’. Although we had possibly some twenty regular supporters missing, due to holidays, we had a wonderful nucleus of fairly regulars and a great time was had by all. Everyone enjoyed Keith’s paintings and he sold some too. 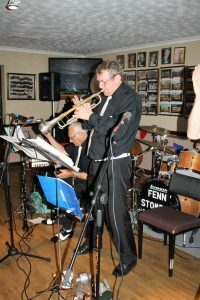 Dave Marchant takes a solo on trumpet, plus Dennis Vick of The Fenny Stompers at Farnborough Jazz Club’s ‘Battle of Britain’ Anniversary fancy dress party on 16th September 2016. Photo by Mike Witt. Dennis Vick (clarinet), Ken Joiner (drums), Dave Marchant (trumpet) and John Lee (trombone) both playing the maracas, with Brian Vick (banjo) and out of view Dave Arnold (Sousaphone) members of The Fenny Stompers at Farnborough Jazz Club’s ‘Battle of Britain’ Anniversary fancy dress party on 16th September 2016. Photo by Mike Witt. I shall also be back to fill you in on this evening too – including photos. Ye Olde Whyte Lyon Public House, built in 1626. Shepherd Neame (photo copyrite 2013). 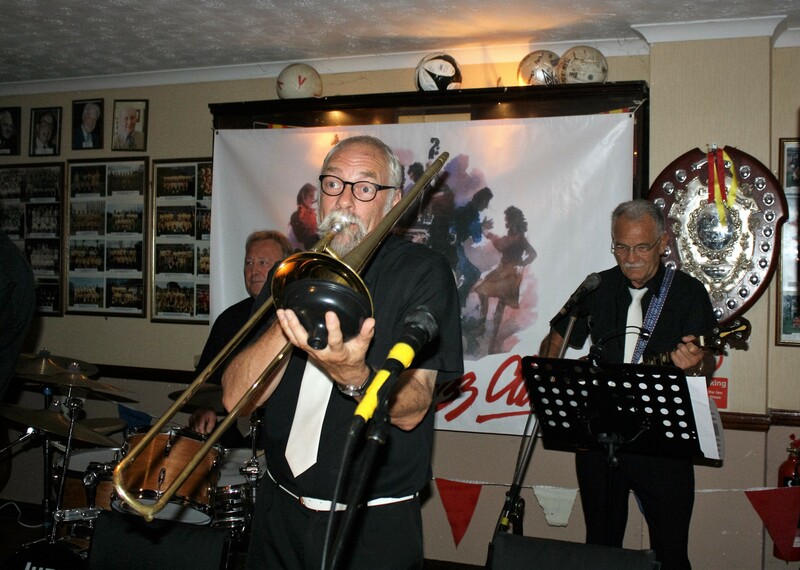 We also had a special date for you to enjoy and this was KEITH GRANT’S QUARTET, 4-IN-A-BAR+1 playing smooth jazz at YE OLDE WHYTE LYON in Locks Bottom (Kent). It was held indoors (Publican Tim had decided not to take a chance with the weatherc, They also have great bar staff, serving tasty SHEPHERD NEAME’s ‘SPITFIRE’ (among other drinks of course, such as ‘Master Brew’). The quartet was KEITH GRANT on drums, JOHN LEE on tenor sax, TIM HUSKISSON on piano, TIM PHAROAH on double bass and the ‘+ 1’ being me (Diane), and I did manage to sing a few songs too, even though I hiccupped a little! This entry was posted in Fenny Stompers Jazz Band on September 20, 2016 by Diane. BOB DWYER’S BIX & PIECES (a seven piece band) is one of our favourites, will be back at FARNBOROUGH JAZZ CLUB tonight, Friday, 9th September 2016. Trombone player BOB, will have with him young ALLEN BEECHEY on trumpet, and special guest PETE CURTIS will be on reeds, HUGH CROZIER on piano &vocals, JOHN BAYNE on double bass &bass sax, DAVE PRICE on banjo &guitar and GRAHAM CAULICOTTE on drums. That line-up should be super, so get your glad-rags on and come on down to happy Farnborough. See you all tonight. This entry was posted in Bob Dwyer's Bix & Pieces on September 9, 2016 by Diane. Ye Olde Whyte Lyon Public House, Shepherd Neame – built in 1626 (photo copyrite 2013). This entry was posted in Uncategorized on September 1, 2016 by Diane. MARTYN BROTHERS will be playing here at FARNBOROUGH JAZZ CLUB on Friday, 2nd September 2016. BEN MARTYN is on double bass &vocals and EMILE MARTYN on drums. They have booked for us, giant trumpeter, PETE RUDEFORTH (back from playing with CHRIS BARBER in Belgium). Also with them will be RICHIE HOWARD on clarinet, IAN BEETLESTONE on piano and JOHN ‘flashback radio’ RUSCOE on guitar. What more can you ask for, you can expect some exciting and energetic jazz, so come and enjoy yourselves. Don’t forget, as well as listening, we will dance too – ha, We also have great bar staff, who serve Shepherd Neame ‘Spitfire’ and of course, plenty of parking space. If you haven’t been here before, everyone is welcome. Music is from 8:00pm till 11:00pm. This entry was posted in Martyn Brothers Jazz Band on September 1, 2016 by Diane.